The following bar chart represents the GDP of different countries during the half decades 2001 - 2005 and 2006 - 2010. All figures are in Rs. billion. Which of the countries listed below accounts for the maximum GDP during the half decade 2006 to 2010 ? It's clear that US is the highest amongst the given options. 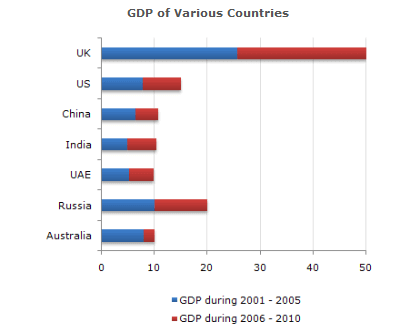 The GDP of UAE is what fraction of GDP of the UK for the decade (approximately) ? Which of the countries listed below accounts for the highest GDP during the half decade 2001 to 2005 ? It's clear that Russia is the answer. Out of every Rs. 10,000 spent during the decade 2001 - 2010 approximately how much was the GDP of Russia during the half decade 2001 - 2005 ? Russia will account for 10 out of 125, i.e, 8% of the total, i.e, 800 out of 10,000 (approximately values based on visual interpretation).